Healthy Eating Workshop- South American Foods. The traditional Latin diet is simple and healthy; it is full of fresh fruits and vegetables, beans, and one-dish meals. In Latin cultures, meals are occasions for friends and family members to come together and enjoy each other’s company. 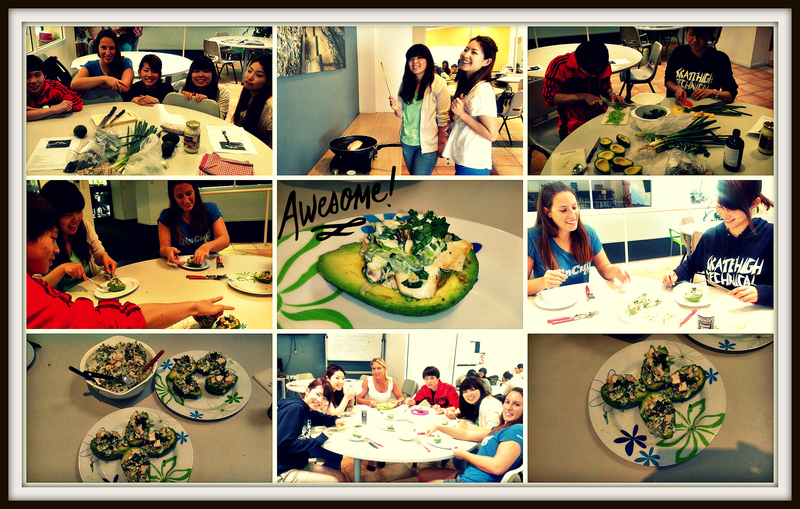 In today’s healthy cooking class the students prepared a traditional Peruvian dish called Palta Rellena, or “stuffed avocado”. Avocados are nutrient dense, low in carbohydrates, high in fibre, antioxidants and healthy mono-unsaturated fats that are anti-inflammatory to the body. A number of age-related diseases have been linked to inflammation, including obesity, cancer, type 2 diabetes, atherosclerosis, arthritis, osteoporosis, depression and dementia. Eating plenty of fresh fruits and vegetables, reducing saturated fats from animal sources, and choosing good oils coming from omega-3 and oleic sources — such as fish, linseeds, avocado, olives and almonds — are steps in the right direction. 1. To make the chicken salad, combine chicken, shallot, celery, currants, toasted almond, parsley, mayonnaise and blasamic vinegar in a bowl and mix until ingredients are evenly coated. Season with salt and pepper. 2. 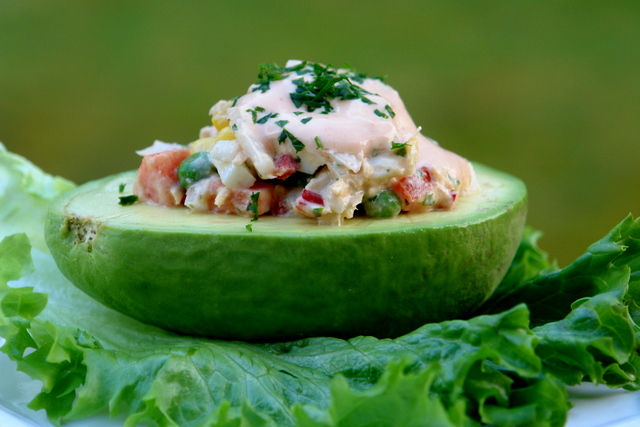 Scoop chicken salad into avocado halves. Garnish with additional parsley and serve.